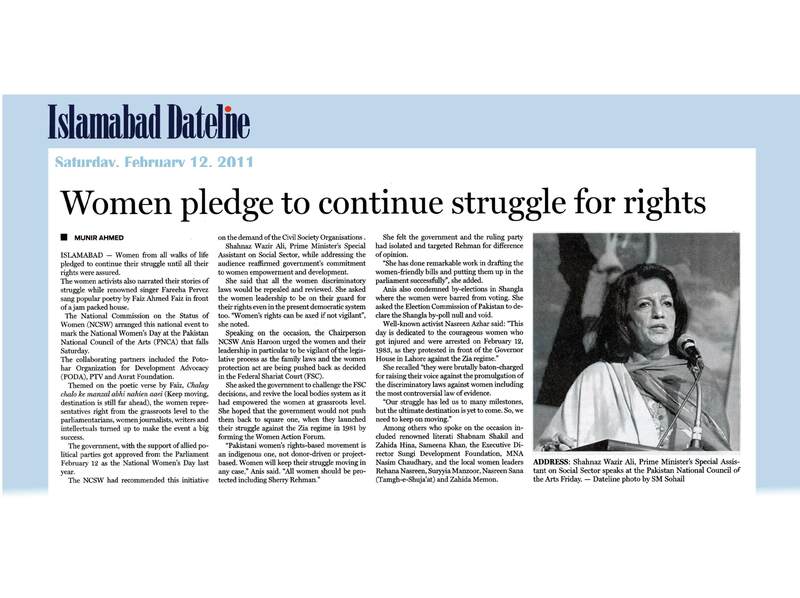 Women's rights bill could not be presented in Sindh Assembly, said Shahla Raza - Sobh. 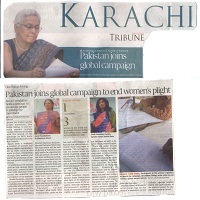 Pakistan joins global campaign to end women's plight - Express Tribune. 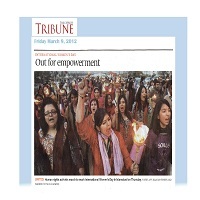 Aurat Foundations launched 'One Billion Rising' campaign - The Nation. 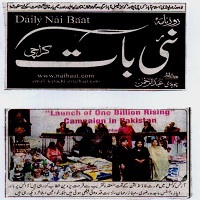 Launching One Billion Rising Campaign in Pakistan - Nai Baat. 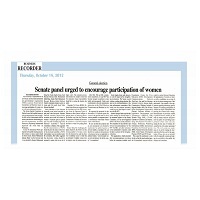 Senate panel urged to encourage participaton of women--Business Recorder. 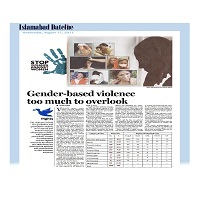 4,585 cases of violence against women reported in 2012-News. 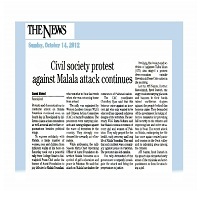 Civil society protest against Malala attack continues-- News. 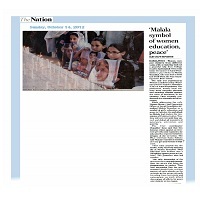 Crowds join Malala rally-Daily time. Malala symbol of women education, peace-Nation. 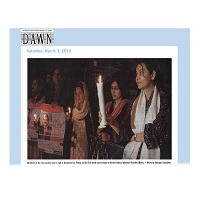 Protest against attack on Malala, DAWN. 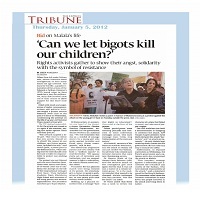 Can we let bigots kill our children-- Tribune. 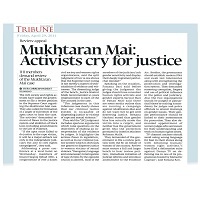 Civil society activists shout slogans outside the National Press Club on Wednesday against the cowardly Taliban attack on teenage activist Malala, Pakistan Today. 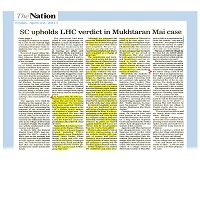 Attack on Malala condemned Pims offers treatment-Dawn. 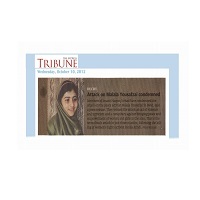 Attack on Malala Yousafzai condemned--Tribne. 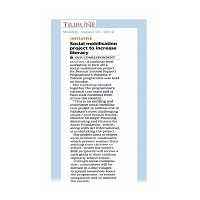 Social mobilisation project to invrease literacy-Tribune. 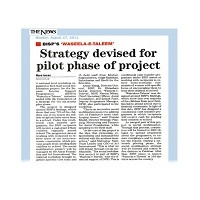 Strategy devised for pilot phase of project-NEWS. 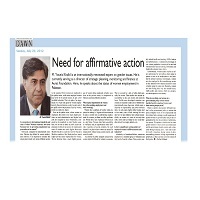 Need for affirmative action Dawn 29 july 2012. 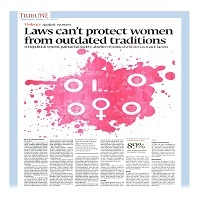 Laws can't protect women from outdated traditions,Tribune. 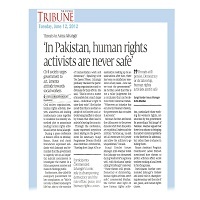 In Pakistan, human rights activists are never saf-Tribune. 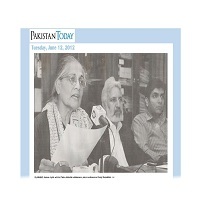 Human Rights activist Tahira Abdullah addresses a Press conference at Sungi Foundation-Pakistan Today. 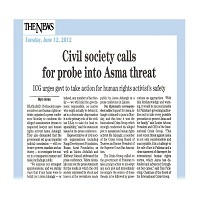 Civil Society calls for probe into Asma threat-The NEWS. 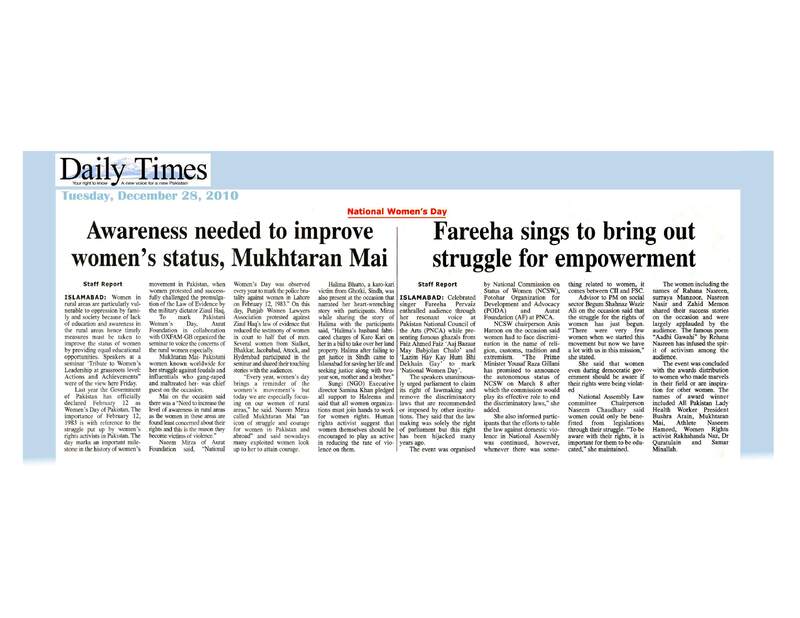 BISP has important role in women’s empowerment, Farzana. BISP has important role in women’s empowerment, Farzana. 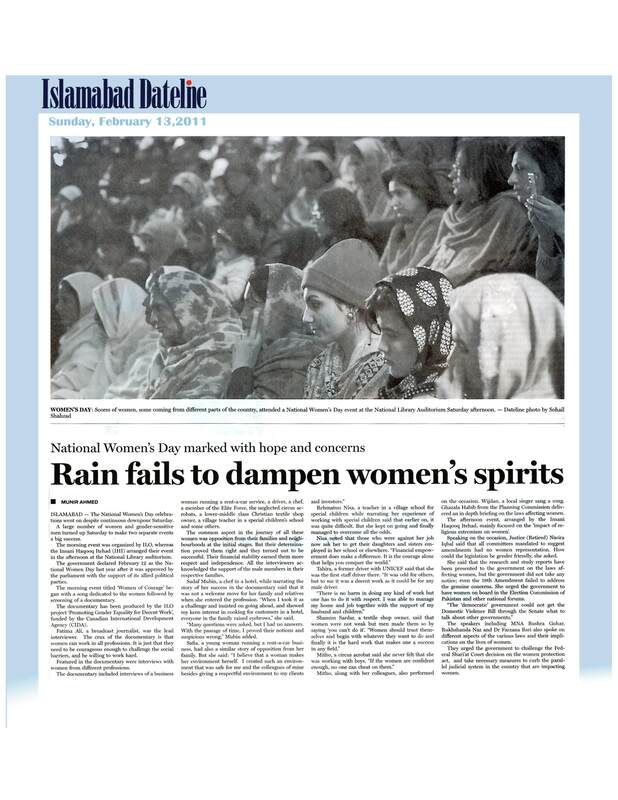 BISP played important role in women’s empowerment, Farzana Raja. 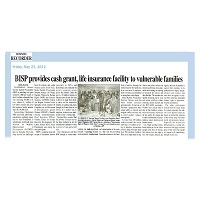 BISP provides cash grant, life insurance facility to vulnerable families. 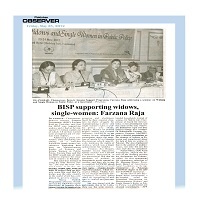 BISP supporting widows, single-women Farzana Raza. 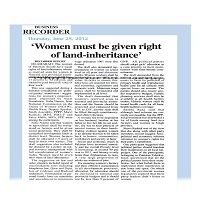 Declaration on single women's rights seeks creating synergies at all levels. 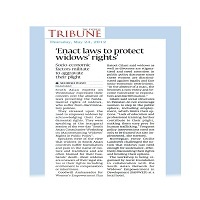 Legislation to create enabling environment for widows urged. 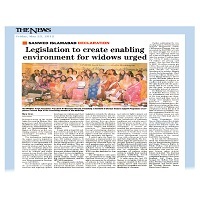 Workshop on issues of widows, single women concludes. 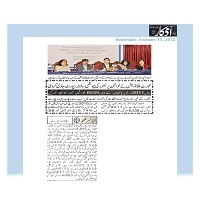 Ausaf Qamar Zaman Kiara and Syeda Fiza Batool Gilani during the consultation on widows rights. 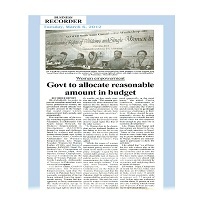 Govt to allocate reasonable amount in budget. 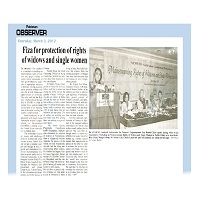 Enact law to protect windows' rights, Tribune..
Fiza for protection of rights of widows and single women, pakistan Observer. 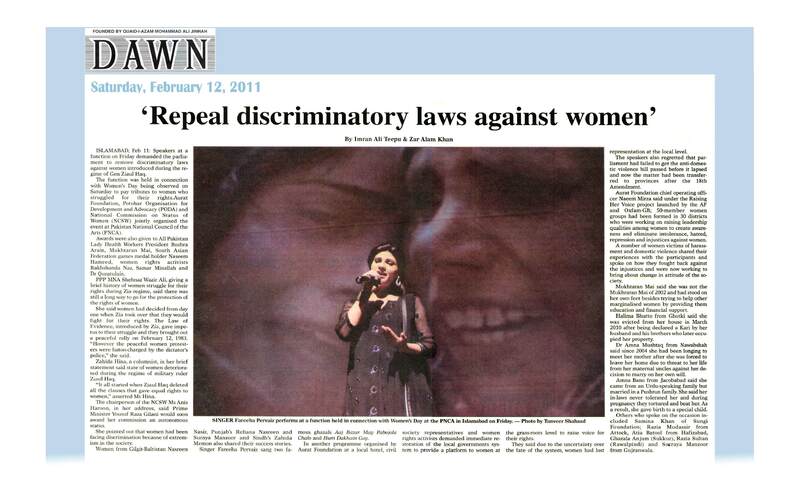 Khabrain Syeda Fiza Batool Gilani, Goodwill Ambassador for Womens' Empowerment. 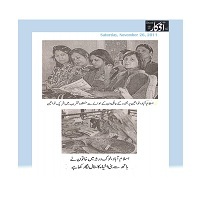 Naw-i-Waqat - Qamar Zaman Kiara and Syeda Fiza Batool Gilani in the consultation on widows rights. 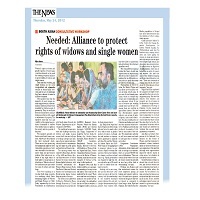 Needed, Alliance to protectt rights of widows and single women, The News. 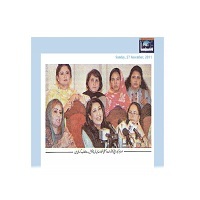 pakistan today 24 Syeda Fiza Batool Gilani addressing SANWED consultation. 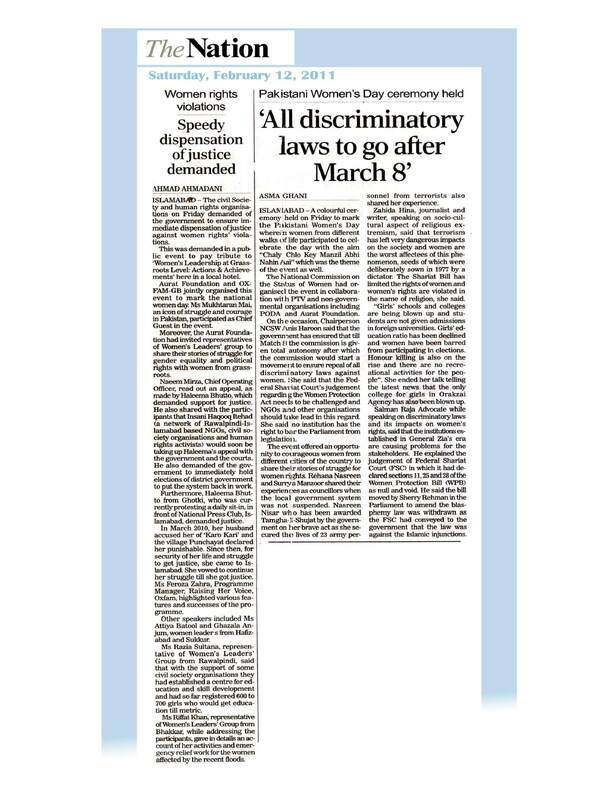 Steps sought to eliminate discriminatory Practices, Nation. 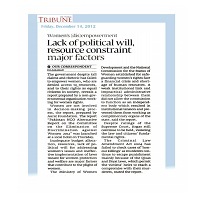 Congenial enviornment within political parties for women earged. Women need to enhace their role in politics. 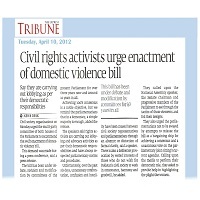 Civil right activists urge enactment of domestic violence bill, TRIBUNE. 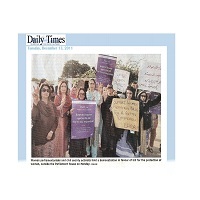 HR activists Seek early passage of domestic violence bill, Dawn. 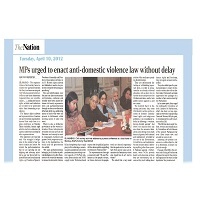 MPs urged to enact anti-domestic violence law without delay, NATION. 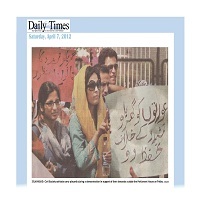 Civil Society activists carry placards during a demonstration in support of their demands outside the Parliament House on Friday, Daily times. 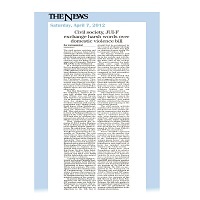 Civil Society, JUI-F exchange harh words over domestic violence bill, NEWS. 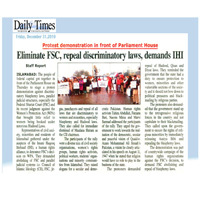 Demo held against deferral of Domestic Vilence Bill, NATION. 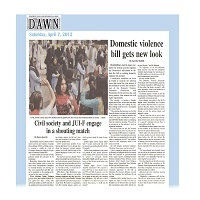 Domestic violence bill gets new look, DAWN. 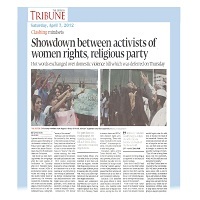 Showdown between activists of women right, religious party, TRIBUNE. 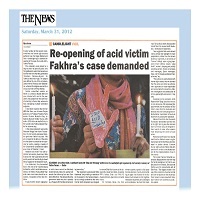 Candlelight vigil re-opening fo acid vicim fakhra's case demanded,News. 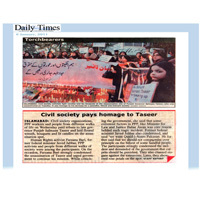 Civil society hold vigil for Fakhra, Datelineislamabad. 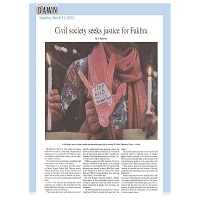 Civil society networks demand justice for Fakhra, Daily time. 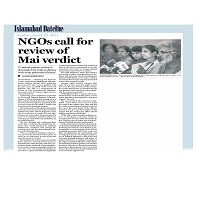 Civil society seeks justice for Fakhra, Dawn. Press Conference to demand legislation on domestic violence. 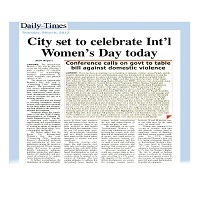 City set to celebrate Int' I Women's Day today, Daily Times. 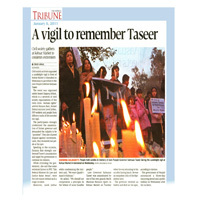 Government shall legislate to end violence against women, ASH- SHARQ lahore. 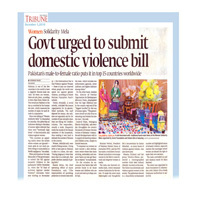 Legislation on domestic violence demanded, Nai Baat. 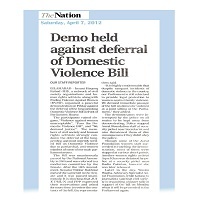 Legislation urged to stop violence against women, News. 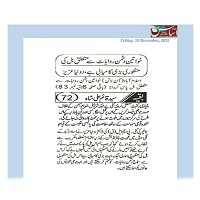 Punjab government asked to legislate on domestic violence, Daily Waqat. 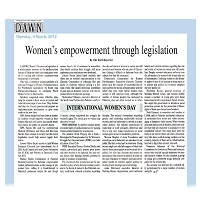 Women's empowerment through legislation, Dawn. Awards distribution ceremony on International Women’s Day’s theme ‘Connecting Girls – Inspiring Future. A group of role model girls with their awards, AF staff and CSO's activists, Nation. 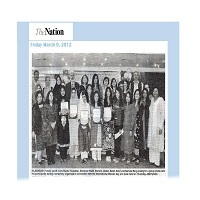 Islamabad, Youth icons pose for a Photograph with participants during a ceremony in connection with Internation Women's Day, News. The role model girls during the awards ceremony, khabrain. 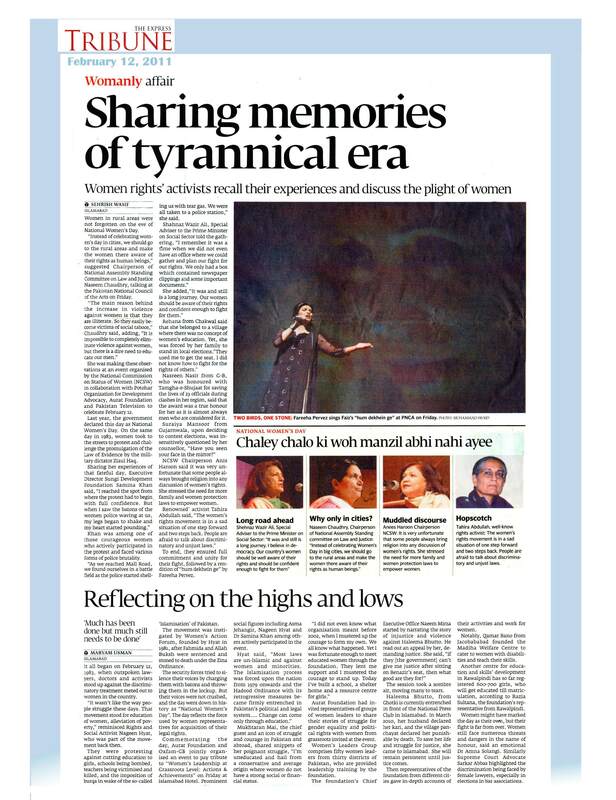 Tribute to role models, Tribune. 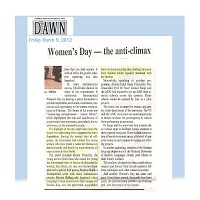 Women's Day --- the anti-climax, Dawn. 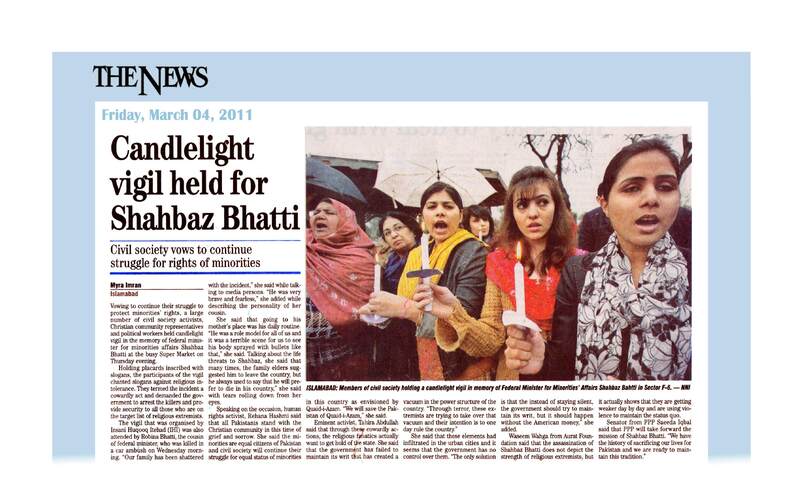 Women march with torches on International Women’s Day. 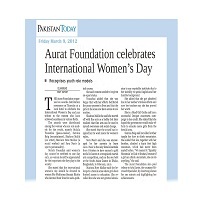 Aurat Foundation celebrates International Women's Day, Pakistan Today. Civil society activists rally in front of the Parliament, holding up torches and paying tribute to heroines of the struggle for women, Dateline. 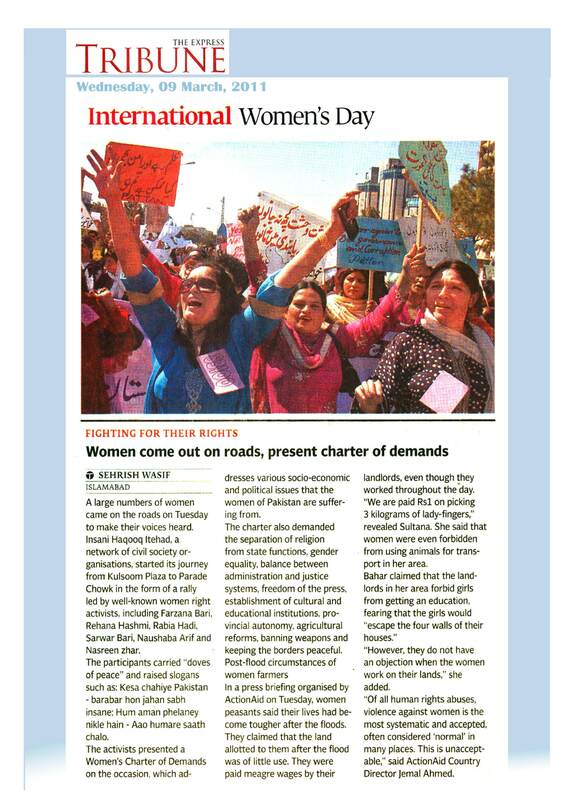 Human rights activists march to mark International Women's Day in Islamabad on Thursday, Tribune. 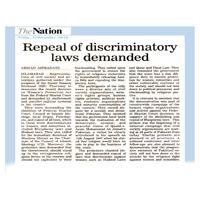 Repeal of discriminatory laws demanded, News. 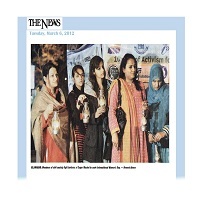 Women holding torches in front of the Parliament House during a rally organised by the civil society to pay tributes to the women and girls of Pakistan, Ausaf. 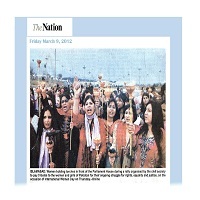 Women holding torches in front of the Parliament House during a rally organised by the civil society to pay tributes to the women and girls of Pakistan,Nation. 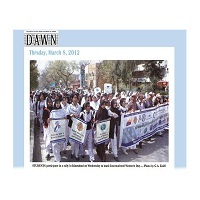 Girls rally for there rights - International Women's Day. 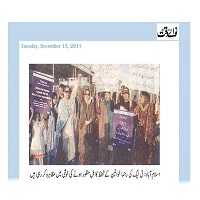 Balochistan working women forum formed. 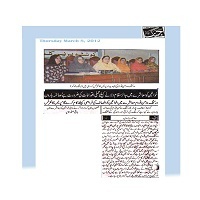 Balochistan working women forum is formed, Mashriq. 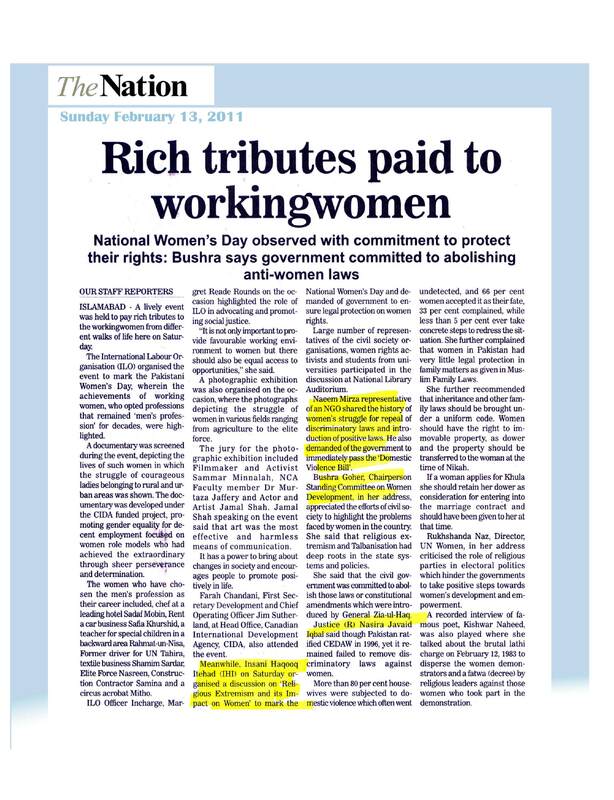 Working women formed to defend women's rights, Express. 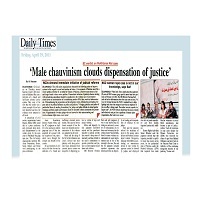 Working women forum would work to provide justice to women,Jang. 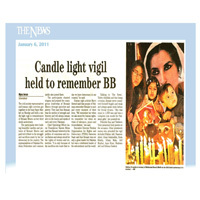 Candle light vigil on International Women's Day. 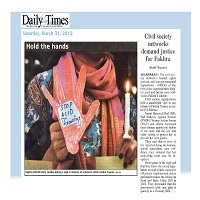 Islamabad, Members of civil society light lanterns at super market International Women's Day, NEWS. 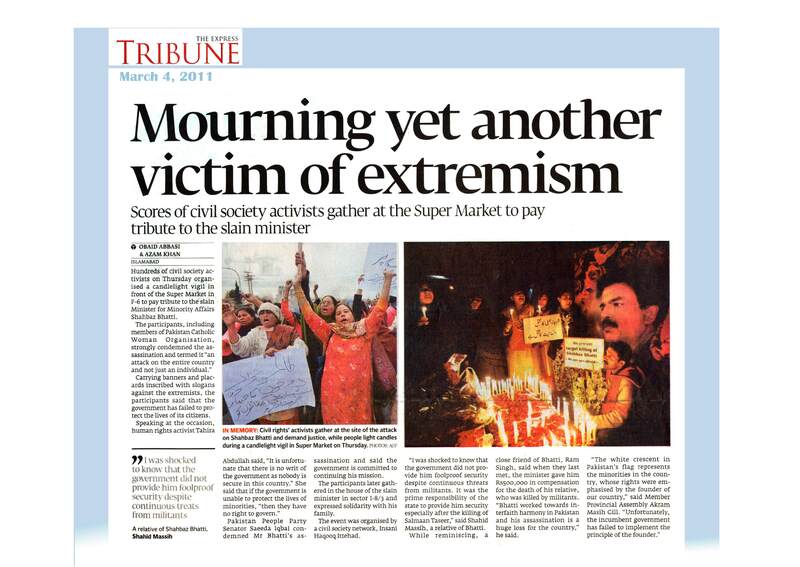 Workers of different NGOs light candles to mark Internation Women's Day at Super Market,Daily times. 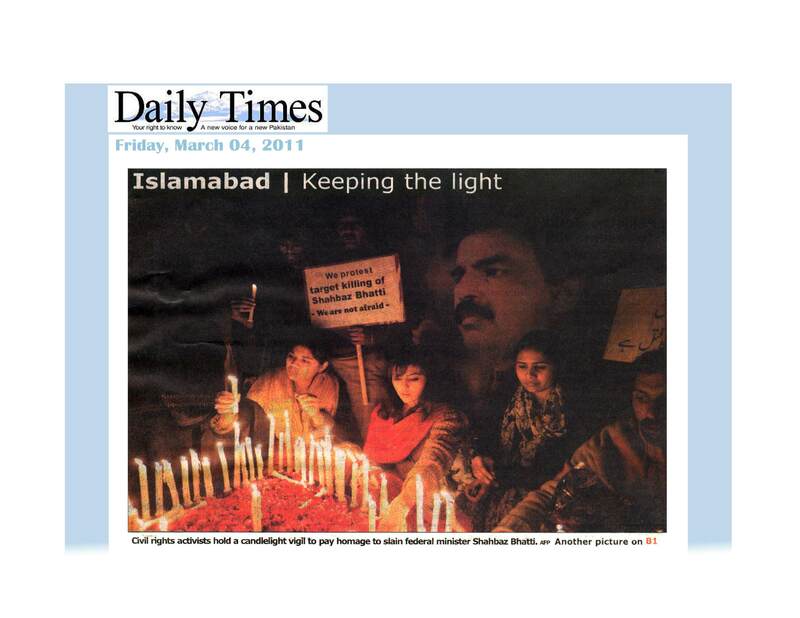 Candle lights vigil on Ist Anniversary of Shahbaz Bhatti. 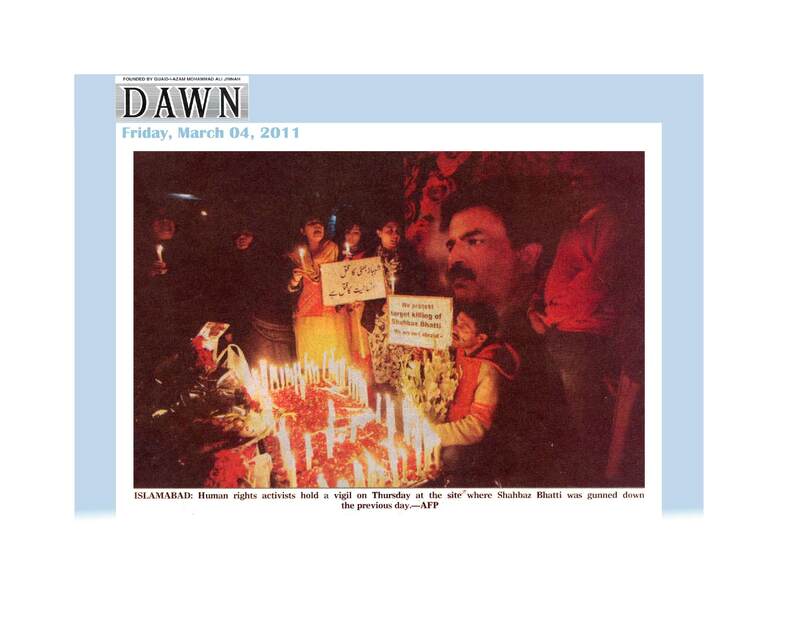 Members of the civil society hold a vigil in Islamabad on Friday on the first death anniversary of former federal minister Shahbaz Bhatti, Dawn. 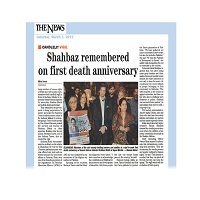 Shahbaz remembered on first death anniversary, News. 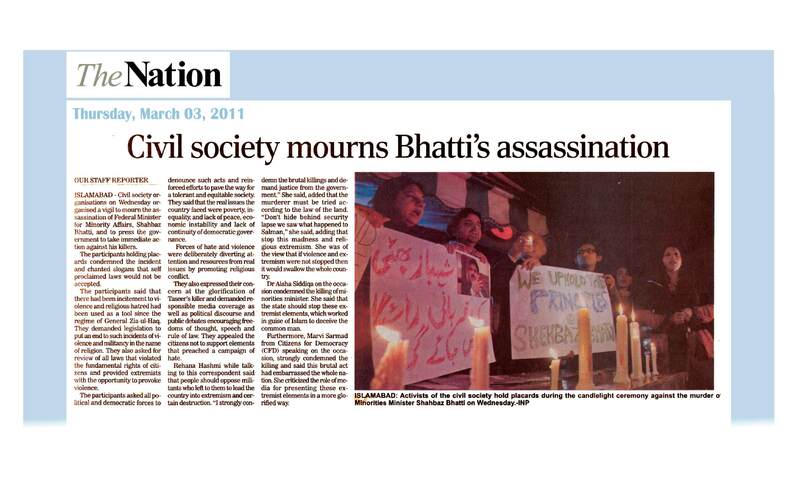 Spreading tolerance, Bhatti's sacrifice not in vain, Tribune. 6.74pc increase in incidents of violence against women. 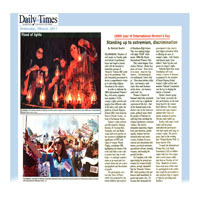 8539 cases of violence against women in 2011. 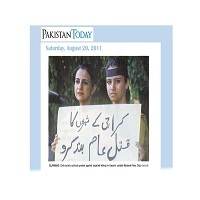 Aurat Foundation launches report on violence against women, Pakistan Today. Aurat foundation released 4th annual Report of violence against women, Azkar. 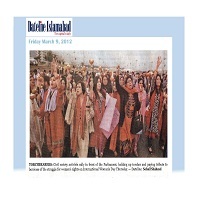 In year 2011, 8539 women fell victim of violence, Jinnah. 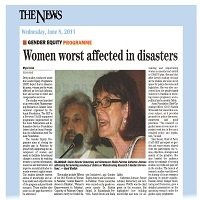 Violence against women increased many folds in 2011, Ausaf. 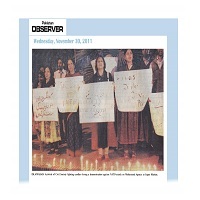 Violence against women increases considerably in 2011, Business Recorder. 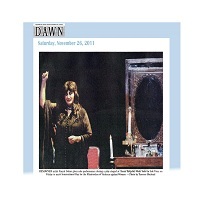 Violence against women on the rise, Dawn. 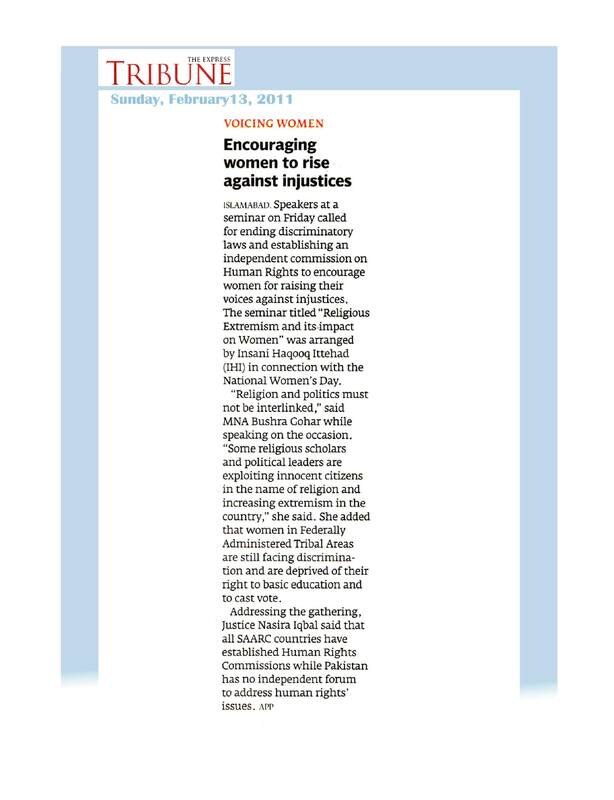 Violence against women touches new heights, Nation. 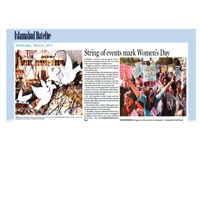 Violence against women up 6.7pc in 2011, dateline islamabad. 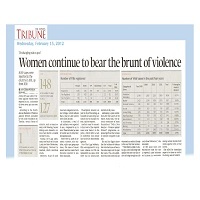 Women continue to bear the brunt of violence, Tribune. 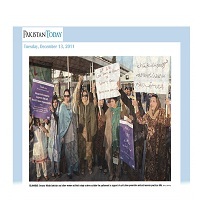 Aurat Foundation launched six-monthly report on violence Against women. 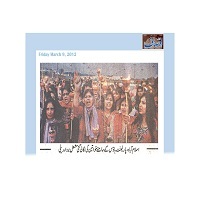 305 Incidents of violence against women in 6 months,Aurat Foundation Report released, aaj. 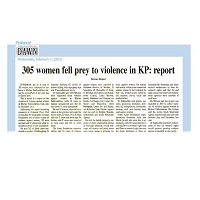 305 women fell prey to violence in KP, report, Dawn. 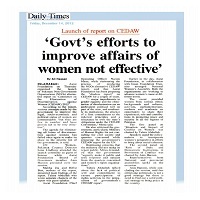 Report on violence against women launched, News. 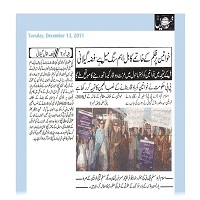 MViolence against women in Khyber Pakhtunkhaw 305 cases of violence in 6 month,Mashriq. 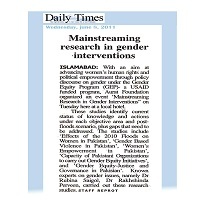 Violence against women, Aurat Foundation six monthly Report released,Express. 77pc cases of honour killings end in acuittal of criminals, Business Recorder. 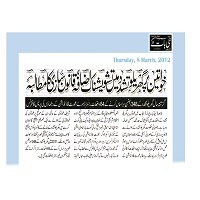 Honour killer taking advantage of lacunae in law, report, datelineIslamabad. 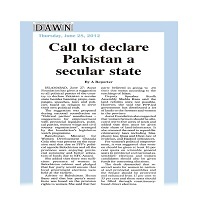 Hurdles in implementing law, Dawn. Major lacunas render the law useless, News. 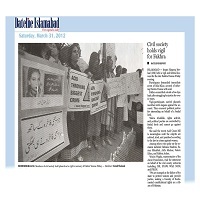 Study on honour killing highlight grim face of society, Pakistan Observer. 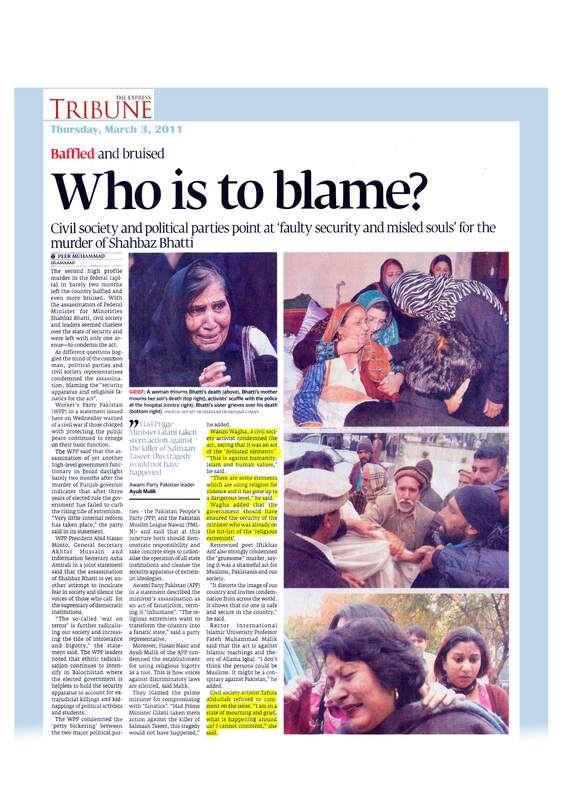 When the enforcers don't get it, how will the victims? 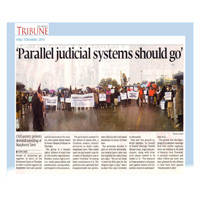 Civil society activists demonstrate against the Punjab law minister - The News. 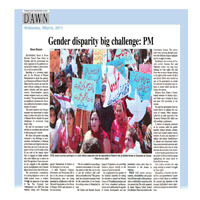 CIVIL society activists hold a demonstration at Faisal Chowk against the Punjab law minister for using abusive language against women - DAWN. 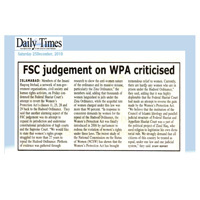 Passage of Anti-Women practices bill is a milestone, Fiza Gilani, Khabrain. 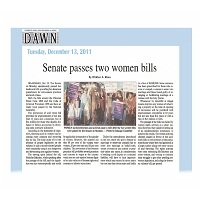 Senate passes two women bills, Dawn. 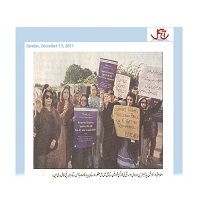 Women parliamentarians and activists of civil society hold a demonstration on Monday welcoming the passage of women right bill, Nation. 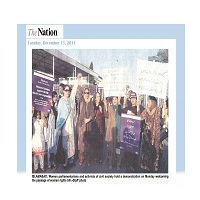 Senator Nilofar Bakhtiar with women's right activist outside the parliament, Nawa-i-Waqat. Making victory sign outside the parliament, Aaj Kal. 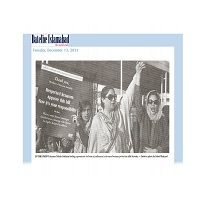 In the front Senator Nilofar Bakhtiar leading a procession in front of parliament in favour of women protection bill Monday,Dateline. 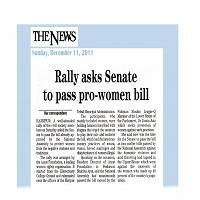 Rally asks senate to pass pro-women bill, News 11. 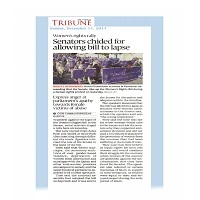 Senators chided for allowing bill to lapse, Tribune 11. Peace activists flay Nato attack, Independent. 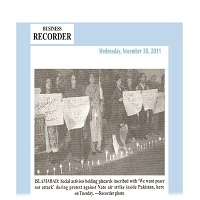 Candlelight vigil to condemn NATO aggression in Pakistan. 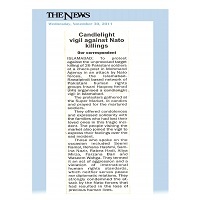 Candlelight vigil against Nato killings, News. 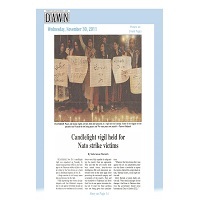 Candlelight vigil held for Nato strike victims, Dawn. 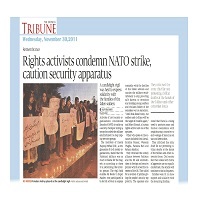 Rights activists condemn NATO strike, caution security apparatus, Tribune. 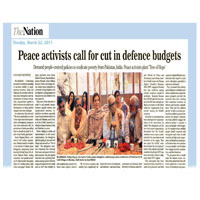 Social activists holding placards inscribed with 'We want peace not attack' during protest against Nato air strike inside Pakistan, here on Tuesday,Business Recorder. 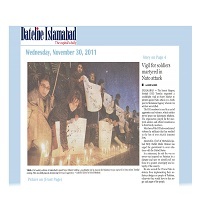 Vigil for soldiers martyred in Nato attack,Dateline Islamabad. 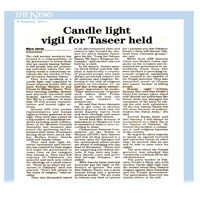 ISLAMABAD, Activists of Civil Society lighting candles a demonstration against NATO attack on Mohamand Agency at Super Market, Pakistan Obsever. 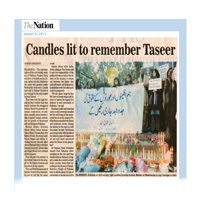 ISLAMABAD, A human rights activist light candles to pay tribute to soldiers killed in NATO strike during a demonstration on Tuesday,Daily time. ISLAMABAD, A human rights activist light candles to pay tribute to soldiers killed in NATO strike during a demonstration on Tuesday, Jinnah, Azkaar. 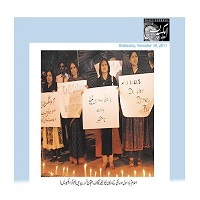 Civil society activists at Super Market holding a candlelight vigil to honour the Pakistani troops martyred in Nato strikes Tuesday eveng,Nawa-i-waqat. 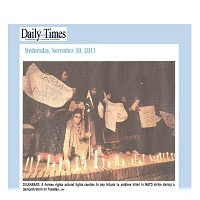 ISLAMABAD activists of Civil Society protesters hold up placards at the candlelight vigil express. 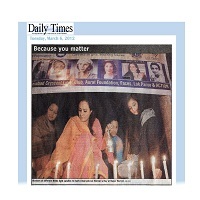 Aurat Foundation started awareness campaign to end violent violence against women. Violence against women continue. 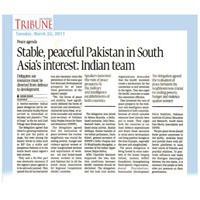 The Aurat Foundation hold a candellight vigil in front of the Punjab Assembly with a theme of from peace in the home to peace in the world, Dawn. 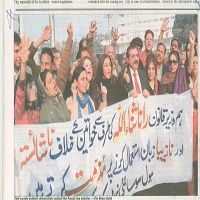 Civil society member protesting against violence against women. Ensure women 10pc general seats. 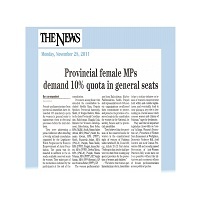 Provincial female MPAs demand 10% quota in general seats. 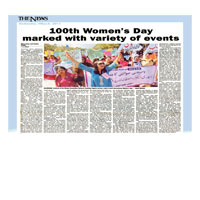 Women lawmakers demand 10% quota for general seats. 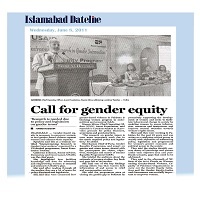 Women MPAs ask political parties to evolve consensus. 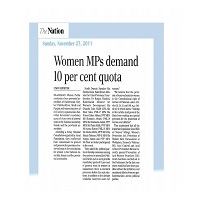 Women MPAs demand 10 per cent quota. 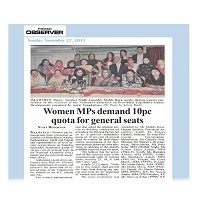 Women MPAs demand 10pc quota for general seats. 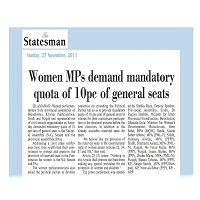 Women MPAs demand mandatory quota of 10pc of general seats. 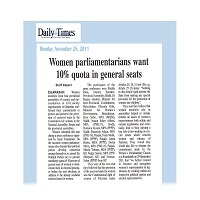 Women parliamentarians want 10% quota in general seats. 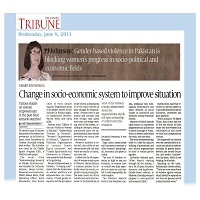 Women MPAs demand 10% quota. 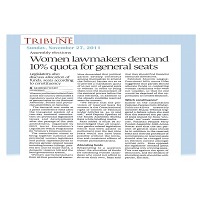 Women MPAs demand 10 percent quota. Women 10 pc general seats. Ensure women 10% general seats. 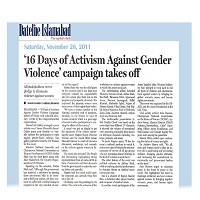 16 Days of Activism Against Gender Violence' campaign takes off. Criminalisation of domestic violence urged. Gender violence is everyone's problem. Passage of Prevention of Anit-Women Practices Bill hailed. 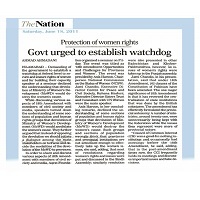 Passage of Prevention of Anti-Women practices Bill hailed. 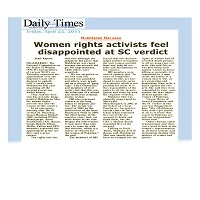 All praise for anti-women practices bill. 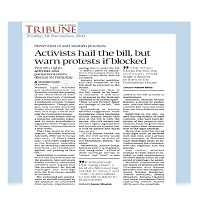 Activists hail the bill, but warn protests if blocked. 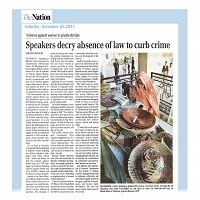 Passage of Anti-Women Practices Bill hailed. 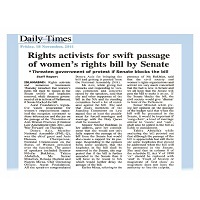 Rights activists for swift passage of women's rights bill by Senate. 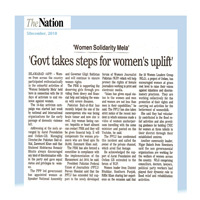 Passage of women rights bill lauded. 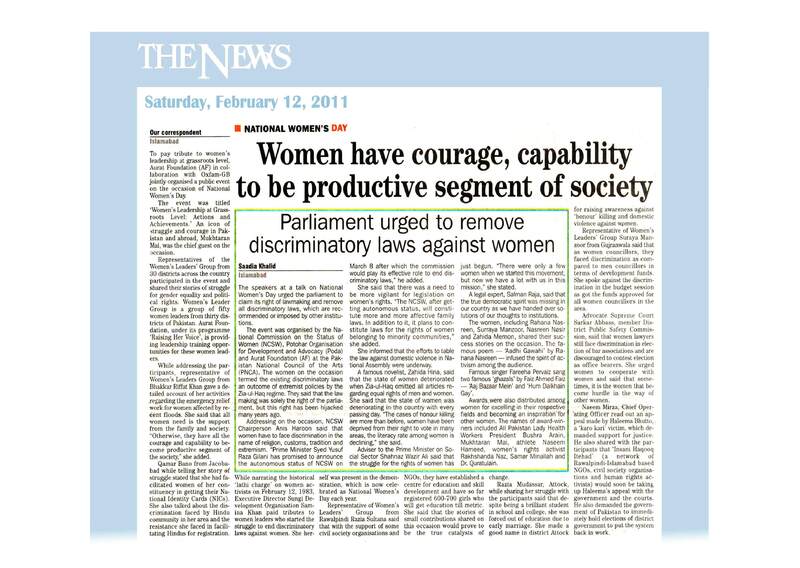 The passage of Anti-Women practices Bill is a huge success - Donya Aziz Passage of women rights bill lauded. 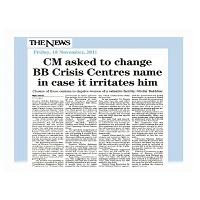 CM asked to change BB Crisis Centres name in case it irritates him. 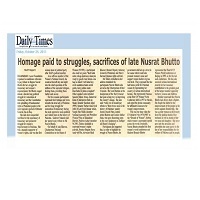 Homage paid to struggles, sacrifices of late Nusrat Bhutto. 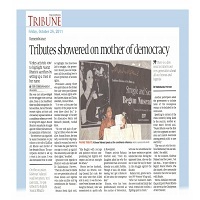 Tributes showered on mother of democracy. 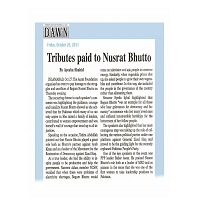 Homage paid to struggles, sacrifices of late Nusrat Bhutto. 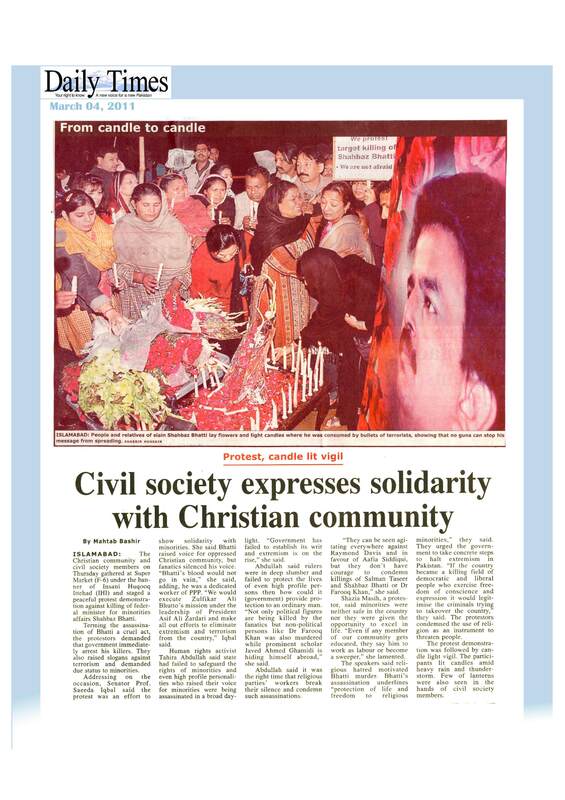 Nusrat rendered matchless sacrifices for democracy. 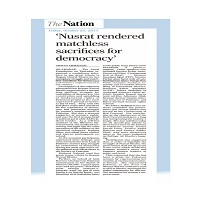 Nusrat rendered matchless sacrifices for democracy. 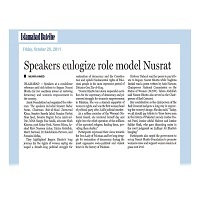 Speakers eulogize role model Nusrat. 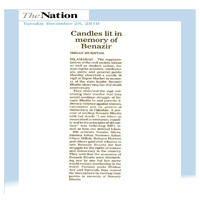 Tributes paid to Nusrat Bhutto. 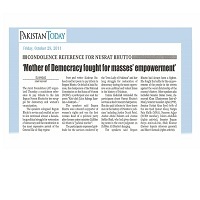 Mother of democracy fought for mases empowerment. 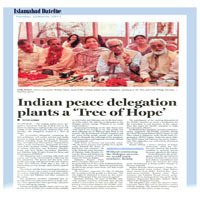 Pakistan's Goodwill Ambassador for Empowerment of Women visited Aurat Foundation. 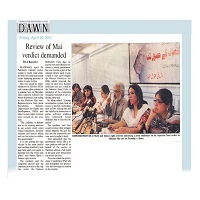 AF launched Report on violence against women in Sindh. 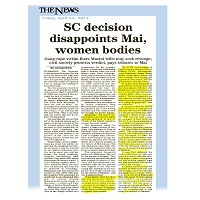 952 women faced violence in six months,aman. 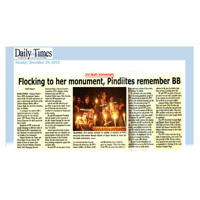 952 women fell prey to violence in six months. 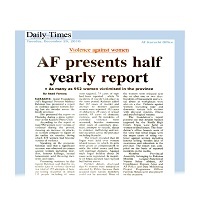 AF presents half yearly report. 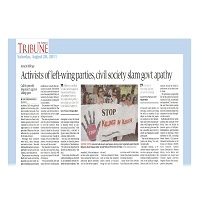 Activists of left-wing parties, civil society slam govt apathy. 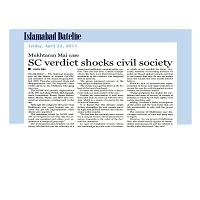 civil society condemns Karachi carnage. 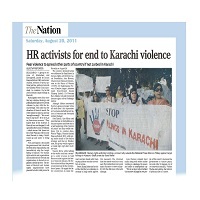 HR activists for end to Karachi violence. 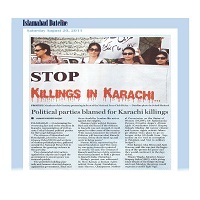 Political parties blamed for Karachi killings. Silence breaking-daily time. 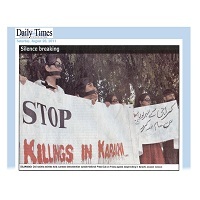 Stop killings in Karachi. 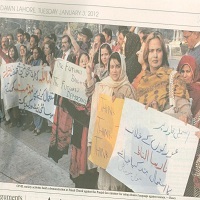 citizens stage a protest outside the National Press club on Friday agaist target killings in Karachi. 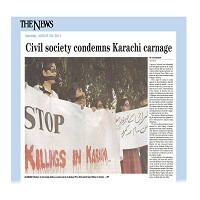 civil society activists protest against targeted killings in karachi. 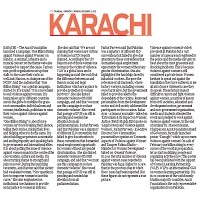 End to karachi violence. 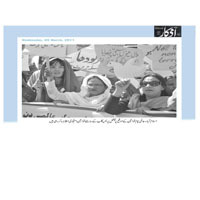 Af launched Report on violence against women. Current year witnessed 4,448 cases of violence agaist women. 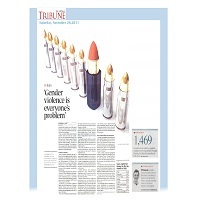 Gender-based violence too much to overlook. 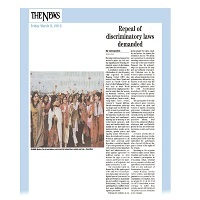 Reported cases of vilence against women show a marked rise. 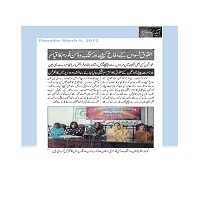 Women's rights and laws shall be made part of our curriculim - speakers at seminar, Karachi. 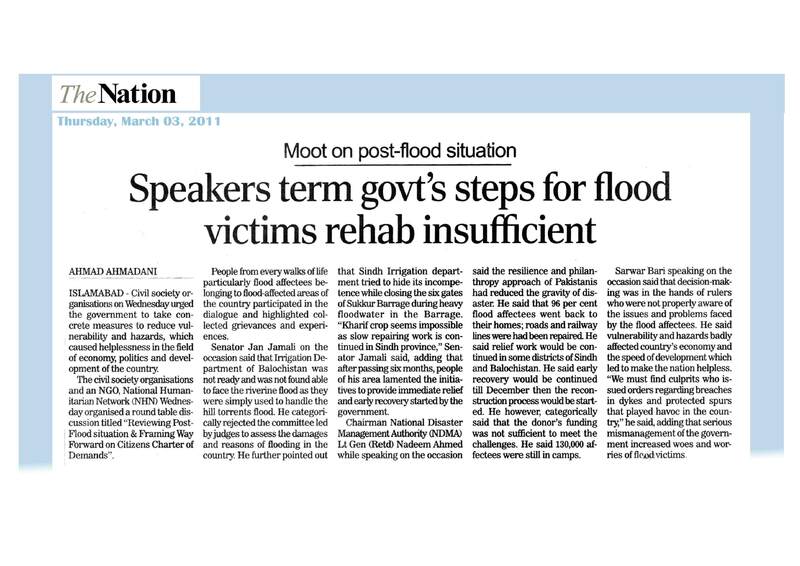 'Govt-people cooperation must for uplift'. Book Launch and lecture. 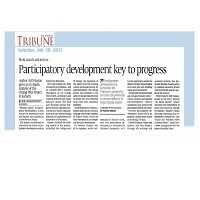 Participatory development key to progress. 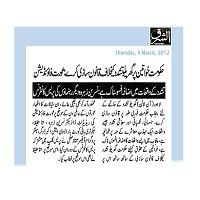 MoU between AF & NADRA to help women get identity cards. Campaign to help women get identity cards. NADRA and Aurat Foundation sign MoU. 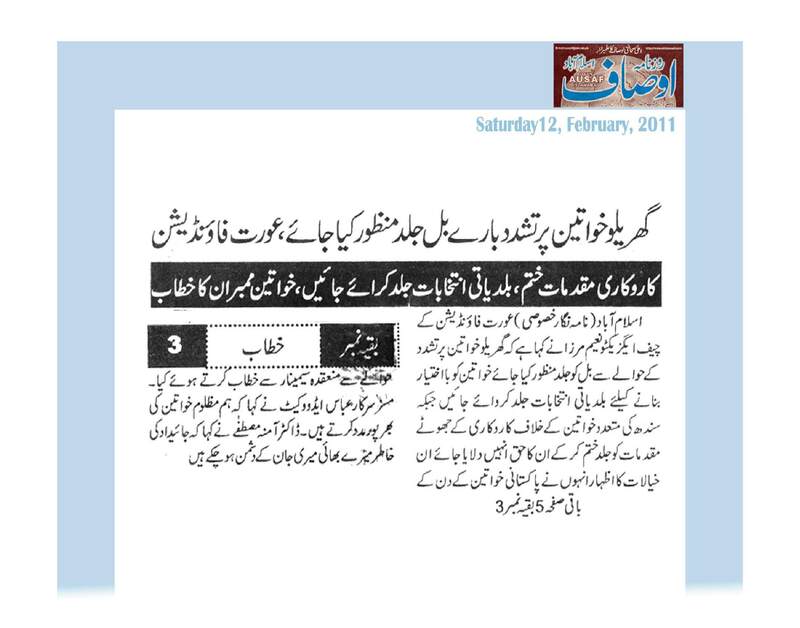 NADRA signs agreement with Aurat Foundation. 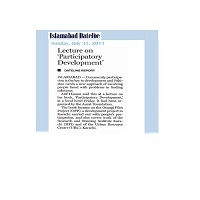 Nadra, Aurat Foundation sign MoU. Annual Report launch: violence against women 2010. 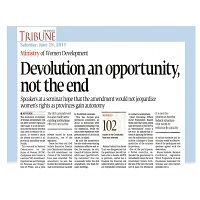 Reported cases continue to grow, devolution raises hope. 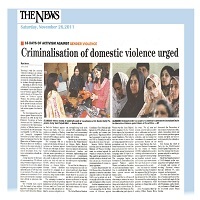 Strategy for controlling violence against women demanded. Cases of violence against women down by 7pc. 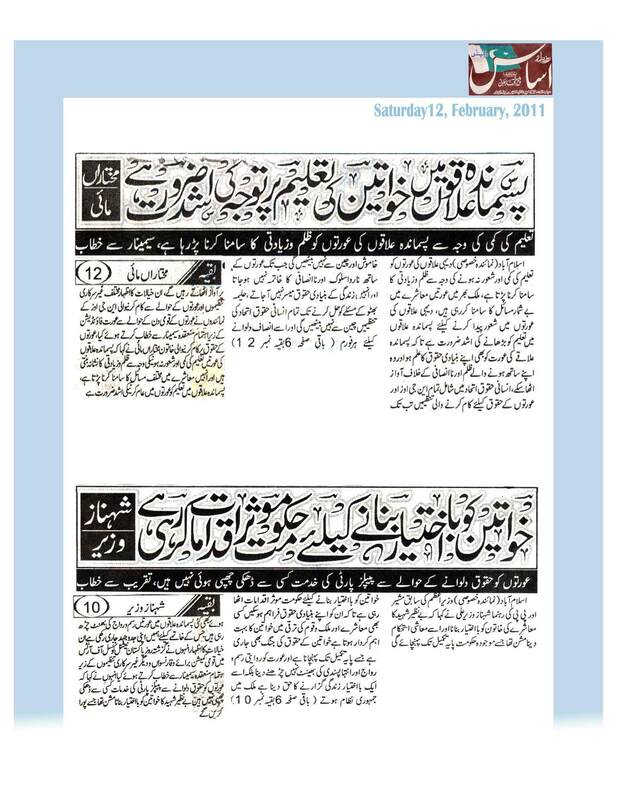 650 cases of violence against women registered in KP in 2010. 8,000 incidents of violence reported in 2010- Report-Nation. Violence against women down by 7pc. 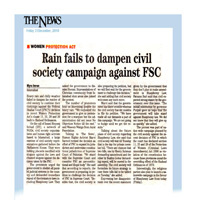 AF starts campaign against closure of women crisis centres. Each year 8500 women face violence Govt urged to own women’s crisis centers. 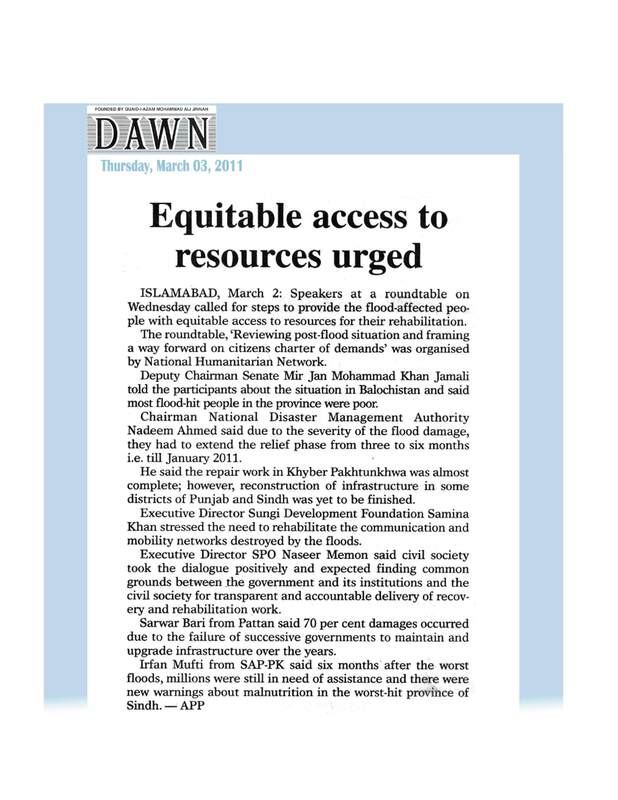 If Punjab Government didn’t provide funds, the crisis centers would get closed. 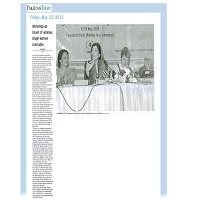 Justice (R) Nasira Javed Iqbal speaking at a press conference arranged by Aurat Foundation Lahore office. 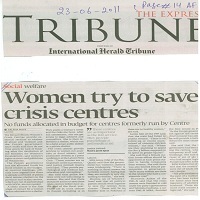 Social Welfare: Women try to save crisis centers. 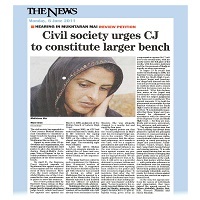 Twelve crisis centers in Punjab be saved from closure, said Justice (R) Nasira Javed Iqbal. 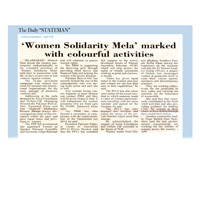 Women crisis centers – demand for patronage. 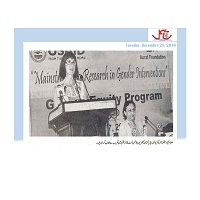 Govt initiates programmes on women's empowerment Guideliness on gender issues offered Islamabad, Chair person NCHD Nfisa Shah addressing the launching of National Advisory Forum organised by USAID at local hotel. 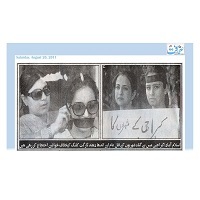 862 women subjected to violence in five months, Jang Karachi 159 women killed, 109 abducted in Sindh during July-December 2010, Anjam Urdu Karachi. 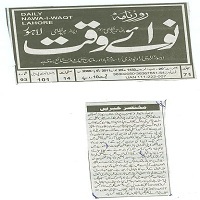 862 women subjected to violence in five months, Ibrat Sindhi Karachi. 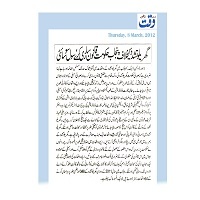 137 women and men killed in the name of ‘honor’ in six months, Aaghaz Urdu. 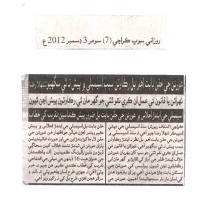 137 women and men killed in 19 incidents of ‘honor killing’, Awami Awaz Sindhi Karachi. 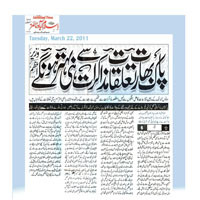 AF press conference, Extra News Urdu Karachi. 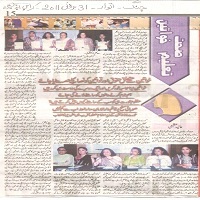 AF press conference, Regional Times Karachi. 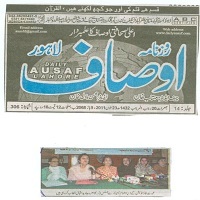 AF press conference, Mehran Sindhi Karachi.